Searching for something tasty to bring to an early meeting? Trying to find a cake that is truly unique? I can help! "Bakes by Sue" can serve all your baking needs, be it birthdays, weddings, business meetings, or just something sweet for the family. I offer a variety of baked goods from jumbo muffins and quick breads, biscuits and brownies, to elegant wedding cakes. My business is about providing personalized service for all your special occasions. I am open to discussing flavors or designs not specifically listed. I use only quality ingredients for my products, such as pure vanilla, real butter and eggs. Along with an assortment of desserts, I offer freshly baked cakes of all shapes and sizes. From a simple 2-layer round cake, to a large sheet cake, or the really exciting 3D cakes. Pricing varies depending on the size and detail of your order. Though most items can be supplied at a moments notice, please contact me at least two weeks in advance for specialty cakes. Baking has always been a passion of mine and I enjoy every opportunity to play with new ideas. Contact me to discuss how I can help you create the perfect cake or dessert for your next big event. 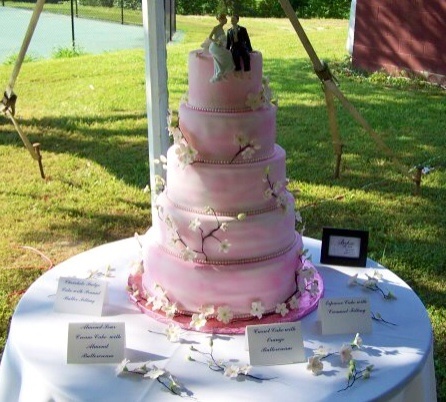 From simple designs to more elegant wedding cakes, I have a wide variety of experience in cake creation.